Wood, MDF and polycarbonate frames are provided assembled, ready for frame contents. This option is for the picture frame only either to replace an existing frame or when you are providing your own "contents". Picture frames provided this way are also called "shells". Professionally attached corners and glued joints. Click on image to select frame sizes and colors. Always popular square gallery profile in natural surface wood veneer. 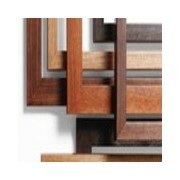 This picture frame is fully "joined", assembled with modern frame equipment, and all joints are traditionally glued. Wood veneers are Natural, Cherry, Walnut and a deep Coffee Brown. Assembled by MATcutter.com in the USA. Custom sizes also available. 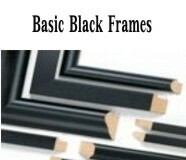 Assembled Picture Frames in basic satin black. Durable black wrap over MDF. MDF is a wood product made from finely ground wood that is put under great pressure and heat to form an extremely smooth base. It is the most cost efficient of our wood lines. Made and assembled in the USA! Select to see more about the picture frames and a listing of your size choices. Compliant with California 93120 Phase 2.